Lara Croft Tomb Raider: Anniversary is the remake of the original 1996 Tomb Raider game. While mostly true to its template, it differs in having new puzzles, later generation graphics, and also an altered storyline. Anniversary was made to celebrate Tomb Raider's 10th anniversary. At first the Anniversary Edition was supposed to be a PSP game made by Core Design, but that version was cancelled after an working prototype already existed. Finally Eidos Interactive announced that Anniversary was being made by Crystal Dynamics; the new game shared the controls and gameplay of the previous game Legend. Lara Croft Tomb Raider: Anniversary has been released on 1 June (Europe) or 5 June (North America) 2007 for PC and PlayStation 2, with the PlayStation Portable, Nintendo Wii, Xbox 360 and PlayStation 3 versions following at a later date. A Demo was release on 25 May 2007. To date the only way to play the game on the PlayStation 3 is by purchasing The Tomb Raider Trilogy, which also includes the other two LAU games. It was released in March 2011. The Xbox 360 version is playable also on the Xbox One through the Backwards-compatibility feature. The story's prelude begins in 1945 in Los Alamos, New Mexico; a mushroom cloud engulfs an abandoned town, uncovering a crystalline structure, sending an unidentified winged creature flying out. Fifty-one years later the game sends us to a cutscene set in Calcutta, India, in which the main story opens: Lara Croft, daughter of Lord Richard Croft is hired by renowned businesswoman Jacqueline Natla through an introduction by her long-time adversary Larson. Natla reveals she has found the location of one of the three pieces that comprise the Atlantean Scion, a mystical artefact buried in the heart of an ancient city, and she wants Lara to retrieve it for her. Lara, sitting back leisurely, leaps from her seat upon hearing this revelation. Fuelled as much by her, and her father's, desires to find the artefact, Lara travels on commission by Natla to the icy mountains of Peru to search for it in the lost city of Vilcabamba. Through the Lost Valley teeming with thought-to-be-extinct dinosaurs and numerous booby traps, she enters a desolate tomb, seemingly undiscovered for millennia. In a further cutscene, Lara finds the corpse of Qualopec. Observing the inscriptions on the wall, it reads that he was one of the triumvirate of god-rulers of Atlantis before it fell beneath the waves, watching over his piece of the Scion even in death. As she peers closely in awe, one of the beast-like creatures suddenly roars at her, before falling laboriously to the floor. Realising this tomb is not uninhabited after all, Lara takes the Scion. The tomb begins to crumble, and so Lara runs for an escape in haste. Qualopec rises from his seat while Lara looks around unnerved. Fortunately, the falling debris traps him. Lara escapes, however, surfacing from the water to find Larson ready to relieve her of her hard earned work. Refusing to bestow the artefact upon him, they engage in a pulse-raising fight, Lara naturally coming out victorious. After giving Larson a good beating, he reveals that another archaeologist has been sent by Natla to look for the second piece, prompting Lara to pay a visit to Natla Technologies to search for more information. A video communication clip reveals Natla knew Lara would never disclose the artefact to her anyway, and the other archaeologist, Pierre Dupont in front of the monastery she instantly recognises; St. Francis Folly, in the Greek Isles. Here she races against Pierre Dupont, a rival archaeologist. Lara uncovers the Tomb of Tihocan, the second of the three god-rulers where she finds his empty coffin, the whereabouts of the body unknown. Pierre then catches up with Lara, threatening to kill her unless she gives him Qualopec's piece of the Scion. Lara refuses, attacking him until he flees from the tomb. However, two centaurs then awake, trampling Pierre to death. After escaping Tihocan's tomb, she leaves for the Sanctuary of the Scion located in Egypt for the third and final piece. As soon as she obtains it, she leaves the Sanctuary and connects the pieces. She blacks out and has a vision about the dawn of time where the god-kings stood in counsel over the third ruler, revealed to be Natla herself. She is being expelled from their sacred order and condemned for unleashing Atlantis' own armies against it and trying to usher in the Seventh Age through the use of the Scion. She is then encased in the crystalline structure which was later uncovered in the blast in Los Alamos. Natla then calmly takes the now complete piece away from the still shocked Lara, clutched by Natla's henchman "Kold". Lara asks her what the Seventh Age was, Natla asking her how far she would go to find out. Natla orders her henchmen to kill her quickly. "Kid", another of Natla's henchmen goes to shoot Lara, but Larson pushes him out the way, purposely missing her with his shotgun. Lara escapes, diving over the edge of the cliff into the lake as Larson fires. Lara pursues Natla on her motorbike, managing to infiltrate Natla's boat undetected. They soon dock to an island which is a remnant of Atlantis, where Natla has mining operations. Inside she meets Larson again, holding a key trying to stop her from continuing further. Larson taunts her, betting she will not shoot him. Insistent on impeding her path, he tells her she would never shoot him because, "that's just not who you are." Lara replies, "I'm not who you think I am". This resulted in Lara shooting him three times in the chest. Larson falls to his knees, and lays down to the ground gasping for air, his hand reaching out to Lara for help. Lara rests her hand on his chest and turns him over, taking the key from his pocket. Looking at her hands horrified at what she has done and completely forgetting that she thought that it was for the good of all man, she vigorously dusts off the imaginary blood on her hands, greatly remorseful from her first human kill thus far. As she continues through, one of Natla's henchmen stands guarding the next chamber wielding a knife. Lara warns him, telling him he will end up like Larson if he does not let her past. Another of Natla's henchmen "Kid" emerges from the shadows with a pair of Uzis. Lara shoots them in her defence, however, Kold stabs Kid so he can kill Lara himself. Kold pins Lara against the wall by her throat, but she is saved when Kid kills Kold with his Uzis from afar before dying of the stab wound. Lara finally catches up with Natla who has activated the Scion, along with the pyramid buried beneath it. Natla tells Lara she has reached the top, that it takes three to rule, that Tihocan and Qualopec were too weak to destroy what stands in the way of the Seventh Age, but Lara has the strength to claim the seat beside Natla's rule. Lara looks at her hands then apologises to her father before shooting and destroying the Scion. Natla charges at her in rage, pushing her off the platform, with Lara pulling Natla down with her. Lara grabs the platform on the opposite side with her grapple, Natla falling to her doom beneath the depths of the lava. Natla later confronts her, still alive, accusing Lara of having a heart as black as hers, after the blood she has spilled. Natla clutches Lara by her throat, stating she cannot be killed, and that she is immortal. The final boss battle is against Natla herself, which ends with Natla slapping Lara's pistols out of her hands and asking Lara what she has accomplished by coming here, and she has only accomplished "a temporary stay of execution for your kind". Natla tells Lara she will find another remnant of Atlantis and continue her plan but Lara has lost everything. Lara goes for her pistols, shoots Natla in the eye and pins her under a falling pillar. Natla screeches in agony as Lara looks at the fallen pillar and tells Natla she hasn't lost anything. Lara escapes the now crumbling pyramid, the island violently erupting. Reaching the shore, Lara dives into the sea and gets into the boat she used to get to the Lost City. She looks back at the exploding island, then at her bloodstained hands as she leaves the erupting island behind. Lara smiles, realising she really did kill Larson for the safety of all man and not for her own selfish desires, and sails off into the horizon. The inventory was similar to that in the original Tomb Raider (rotating ring). Additionally Lara had a grapple. There are 52 secrets in Tomb Raider Anniversary. 8 of them are special Relics, the rest are simple artifacts. Lara wore her classical braid, not the hair of Tomb Raider Legend. Throughout the basic game she was dressed in her Classic green Outfit. As in Legend, several costumes were unlockable, such as the Sola Diving Suit and a full body black Catsuit. There were no in-game vehicles in this game. Lara drove her blue Norton Motorbike. The Tomb Raider Legend controls are also used in Tomb Raider: Anniversary. There were some new moves such as the ability to run along a wall using a rope or to balance on a pillar. The environments in Tomb Raider Anniversary are much more interactive: Lara can use them for lots of things, pick up a piece of wood on the ground and use it as a ladder. Puzzles are more complicated than in Tomb Raider Legend. There is no clue or sparkling thing to show you where to go. There is more than one way to explore the environments and complete a level. You can choose the acrobatic way, or the easier way. Fighting enemies is still an important part of the game: the beast are much more realistic and their AI has really been improved. They are more dangerous than before, they develop a real strategy to kill you. For example the Raptors run around Lara in circles until they are enough to jump at her and attack her. There will be checkpoints like in Tomb Raider Legend where the game is saved. the world’s greatest action heroine of all time – use all of Lara's guile, latest fluid movements, athleticism and gadgets in her quest to conquer the unknown and uncover ancient artifacts. enter into strange, undiscovered lands and solve their deepest, darkest mysteries, open doors to new realms, uncover great rewards and unearth secrets to Lara's past. Crystal Dynamics latest technology allows you to fluidly manoeuvre Lara using her latest moves and gear, through all the worlds from the original; Peru, Greece, Egypt and more. The dynamic world allows multiple play-through options and also opens up new places and ways to explore. Encounter fierce animal and supernatural enemies, wolves, bears, crocodiles, horrific monsters and of course, the T Rex. New and improved AI means that all enemies will exhibit a more diverse behaviour set, providing improved combat challenges for the player. The original Tomb Raider game designer, Toby Gard and Tomb Raider: Anniversary’s Game Director Jason Botta from Crystal Dynamics, provides an unlockable commentary on how this game was made, with some previously undisclosed secrets from Toby about the original Tomb Raider game. Eidos Interactive Ltd., one of the world's leading publishers and developers of entertainment software, can confirm the European street date for the PlayStation 2 and PC Games For Windows versions of Lara Croft Tomb Raider: Anniversary will be June 1st 2007, with the PSP version to follow very shortly. The world's love affair with Lara Croft began back in 1996 with the launch of the original Tomb Raider game. Since then, Tomb Raider has gone on to become one of the world's most successful videogame franchises of all time, and Lara's latest adventure, Tomb Raider: Anniversary is a celebration of Lara’s original adventure in an entirely new Crystal Dynamics game. "Our goal was to capture the essence of what made the original Tomb Raider game such an incredible adventure, and use this to create a brand new Tomb Raider game. Building on the technology, tools and experience we developed for Tomb Raider: Legend, we've created Anniversary, a completely fresh experience for Tomb Raider fans and a brand new game for those who are new to the series," said Sean Vesce, Studio Manager, Crystal Dynamics. "The original Tomb Raider game made Lara Croft the icon she is today. Tomb Raider: Anniversary is our way of paying tribute to Lara and the history of the franchise that will not only appeal to her fans, but also encourage a whole new generation of Lara lovers," said Kathryn Clements, Senior Brand Manager, Tomb Raider. Lara Croft Tomb Raider: Anniversary will ship throughout Europe on June 1st on PlayStation 2 and PC Games For Windows. Eidos Interactive, one of the world's leading publishers and developers of entertainment software, confirms today that they are developing a special '10th Anniversary Edition' of Tomb Raider. "Our '10th Anniversary Edition' of Tomb Raider, is a one-off title to celebrate both Lara and Tomb Raider, it will appeal not only to the loyal fans of the Tomb Raider series but will also attract a totally new audience." Said Larry Sparks, Head of Brands Management at Eidos. The special '10th Anniversary Edition' of Tomb Raider will be available on PlayStation 2, PSP and PC. We've also made plans for an anniversary edition which will be coming out next year, Ian Livingstone said in an interview with Eurogamer. Eidos Celebrates with Lara Croft Tomb Raider: Anniversary Inspired by the original Tomb Raider comes a totally new Lara adventure. Eidos Interactive Ltd., one of the world's leading publishers and developers of entertainment software, today confirms that the next Tomb Raider game will be entitled Lara Croft Tomb Raider: Anniversary and is set for release on PlayStation 2, PlayStation Portable (PSP) and PC in 2007. 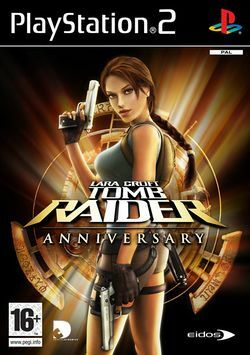 Inspired by the first Tomb Raider videogame, originally released in 1996, LARA CROFT TOMB RAIDER: ANNIVERSARY is a totally new 2006 adventure for Lara, faithfully preserving the elements which made the original Tomb Raider such a classic, selling over 7 million copies worldwide. Using an enhanced 'Tomb Raider: Legend' game engine, the graphics, technology, physics and engine bring Lara's adventure and pursuit of a mystical artefact known only as the Scion right up to today's technology standards and will offer gamers a completely new gameplay experience. "Over the years we have had literally thousands of requests to re-make the original Tomb Raider for today's gamer, we have gone a step further, we have taken the original story and made a completely new version for Tomb Raider: Anniversary." said Kathryn Clements, Senior Brand Manager, Eidos. "We are re-telling an incredible story using today’s technology, we've taken all of the key moments from the original game and put them into the context of a brand new Tomb Raider adventure which will make fans of the franchise extremely happy but also attract a completely new audience." "We've captured the essence of what made the original game so special and with today's technology, created a game that pushes the boundaries of the current gaming consoles. Tomb Raider: Anniversary is a special celebration of Lara's reign as videogaming's leading lady" said Ian Livingstone, Eidos. Lara Croft Tomb Raider: Anniversary is currently in development by Crystal Dynamics and will be available in 2007 on PlayStation 2, PSP and PC. On the PS2 square or grapple is only used once in the last interactive cutscene. Unlike its predecessor and successor, Anniversary didn't appear on the Nintendo DS. This page was last modified on 18 August 2018, at 22:25.